United Airlines and Continental Airlines on Monday said they will merge in an all-stock deal worth over $3 billion that will create the world's largest carrier with annual revenues of nearly $29 billion. The two American carriers have entered into a definitive merger agreement today, which is expected to close in the fourth quarter of this year. The merged entity will be known under the brand name of United Airlines and will be based in Chicago, the headquarters of United. Continental is based in Boston, which will cease to exist post-merger. "The all-stock merger brings together two of the world's premier airlines, creating a combined company well positioned to succeed in an increasingly competitive global and domestic aviation industry," both companies said in a statement. Based on the United's share price on Friday and Continental's outstanding shares, the deal is estimated to be worth over $3 billion. The combined entity, with annual revenues of as much as $29 billion, would be the world's largest airline in terms of passenger traffic. The new airline will serve over 144 million passengers annually, as they separately fly to 370 destinations spanning 59 countries today. The holding company for the new entity would be named United Continental Holdings and the airline would be known as United Airlines. "Aircraft will have the Continental livery, logo and colours with the United name, and the announcement campaign slogan will be Let's Fly Together," the statement said. The new airline would offer enhanced services to Asia, Europe, Latin America, Africa and the Middle East. "On a pro forma basis, the combined company would have annual revenues of approximately $29 billion based on 2009 financial results...," the statement added. The statement said the merger is expected to deliver $1 to 1.2 billion in net annual synergies by 2013. "The companies believe the effect of the merger on front-line employees will be minimal, with reductions coming principally from retirements, attrition and voluntary programmes." 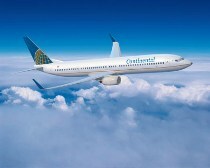 As part of the merger, Continental shareholders would receive 1.05 shares of United's common stock for each Continental common share they own. The shareholders of United would own about 55 per cent of the equity of the combined company. The combined organisation would have a 16-member board that includes six independent directors from each of the two companies and two union directors. UAL chairman, president & CEO Glenn Tilton would serve as non-executive chairman of the new entity, while Continental chairman, president & CEO Jeff Smisek would be the CEO and a board member of the new company.